Looking for a New Toyota Prius Prime in your area? CarGurus has 1,302 nationwide Toyota Prius Prime dealers with 5,752 new car listings. The Toyota Prius has become an icon of environmentally conscious motoring. 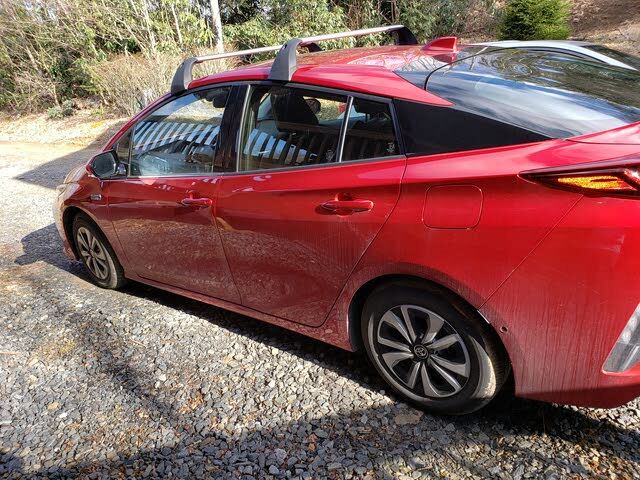 This standard bearer of green driving became so popular that it spawned its own sub-brand, including the range-topping 2018 Toyota Prius Prime. This plug-in hybrid version of the Prius has a unique look and powertrain features. The Prius Prime swaps out the avant garde headlights of the standard Prius with more conventional headlights. The silhouette, as in past generations, combines the look of a sedan with the functionality of a hatchback. The interior of the Prius Prime includes an all-white bezel for the shifter and tray for the wireless charging pad in the center console. The Prius Prime features a center dash instrument panel and a standard 7-inch touchscreen infotainment system. What sets the Prime apart is the available large 11.6-inch central touch screen. Arranged in a portrait layout, it provides a charging station maps app so you’ll always know where to plug in the Prime. Out back, the Prime features a 60/40 split-fold rear seat, giving way to as much as 19.8 cubic feet of cargo space. It is accessed via a large hatchback opening, making it easier to pack large items. With the rear seats up, the Prius Prime features a 2+2 seating layout, which loses the rear middle seat but ensures comfort for two rear passengers. The Prius Prime is available in three trims—Plus, Premium, and Advanced. The Plus is the entry-level model; it comes standard with remote keyless entry, push-button start, Quad-LED projector headlights, and remote-activate climate control. The Premium trim adds the larger touch screen, wireless charging, and SofTex leather-trimmed front seats. The range-topping Advanced includes a head-up display, LED fog lights, LED accent lights, and blind-spot monitoring with rear cross-path assist. The Prius Prime comes equipped with a 1.8-liter 4-cylinder engine, combined with a lithium-ion battery pack and electric motor. Thanks to the plug-in hybrid drivetrain, the Prius Prime achieves a mile per gallon equivalent (MPGe) of 133 MPGe. When the 25-mile electric range is exhausted, the Prime returns a combined fuel economy of 54 miles per gallon. It takes five and a half hours to charge the Prime’s battery pack, but it takes roughly two hours when using a 240V fast-charger system. The Prius Prime comes standard with Toyota Safety Sense P (TSS-P). This safety system includes forward collision warning with pedestrian detection, adaptive cruise control, lane departure warning, and automatic high beams. Base MSRP for the 2018 Prius Prime is $27,100 for an entry-level Plus model. A Premium trim starts at $28,800, and the range-topping Advanced model starts at $33,100. The Prius Prime makes for a highly competitive plug-in hybrid by combining upscale tech features with usable zero-emission driving. What's your take on the 2018 Toyota Prius Prime? Users ranked 2018 Toyota Prius Prime against other cars which they drove/owned. Each ranking was based on 9 categories. Here is the summary of top rankings. Have you driven a 2018 Toyota Prius Prime? Enter your zip to see incentives for a new Prius Prime in your area. Looking for a Used Prius Prime in your area? CarGurus has 3,280 nationwide Prius Prime listings starting at $17,000.